Bring charming, classic style into your backyard or garden with the Achla Lattice Arbor I. The traditional shape and detailing on this unit create a welcoming look to any setting, while the graphite colored finish adds a bold hint. Diagonal rods within each side panel form a diamond-shaped lattice, and a matching piece at the top completes the item. The arbor reaches 92" tall overall, and handily supports a climbing vine. The wrought iron body remains durable for many seasons, and the powder coated finish protects the item from the weather. The unit assembles easily without any hardware, making it perfect for use with indoor events, and the included display feet ensure a stable centerpiece. For outdoor use, insert the arbor legs directly into your soil. 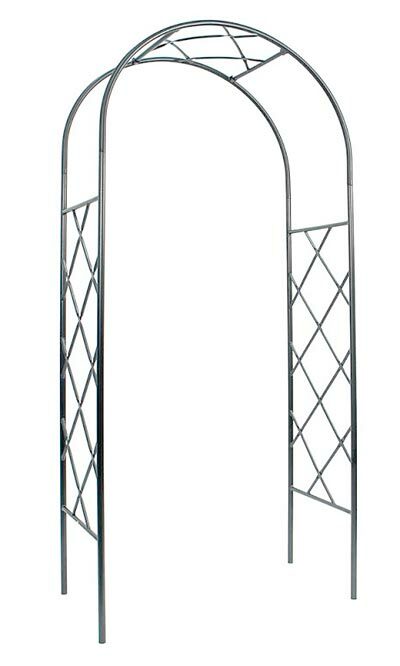 Add wonderful contrast to your garden with this Lattice Arbor I. Assembly required.